re you finding exciting games to experience the thrills? The inflatable zip line will be your choice. What is inflatable zip line? we've come up with a portable, inflatable version. Best of all, there's no need for steel or excess weight! With our revolutionary "sealed air" frame, we've eliminated the need for a heavy steel frame that takes time to set up and extra space in your vehicle. The "sealed air" frame keeps the unit from collapsing from the weight of the rider, whereas an entirely cold air Zip Line would be too big and heavy to maneuver to keep your rider safe. How to play with the inflatable zip line? Climb the stairs to the top platform after being harnessed below, get attached to the Zip Line cable and experience the exhilarating thrill as you zoom down the Zip Line like you were Indiana Jones. Everyone loves flying through the air and anyone can do it. What is the specification of the inflatable zip line? other customized size are acceptable. Where to find inflatable zip line manufacture? And what is the price for the inflatable zip line? Please contact us for more information! 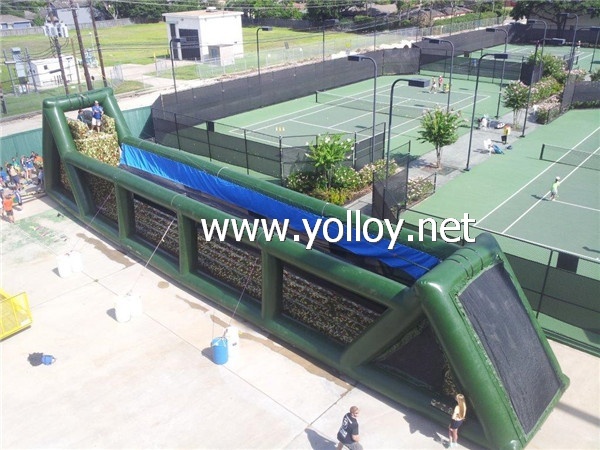 inflatable portable zip line, portable inflatable zip line, zip line for sale, mobile inflatable zip line, zip line inflatable for carnival, inflatable zip line for party, inflatable zipline party rental, inflatable zipline for kids, kids zip line for sale, mobile zipline with low cost.